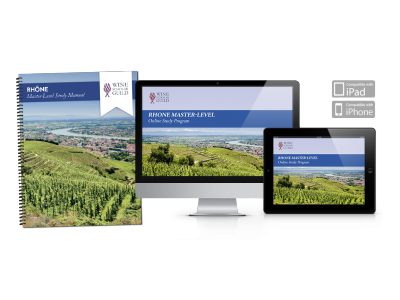 A comprehensive online study and certificate program on the wines of the Rhône Valley. I just had to drop you a note to tell you how blown away I have been with the Rhone seminars. Facts are useful, but when the facts are put into context so that you can truly understand what the facts mean- that is golden. I am so very impressed, and I say that as both a student and an educator. It's a joy to see a master teacher at work. &quot;A Taste of the Rhone&quot; seminar was worth the cost of the program alone. Every section was educational and interesting with Roger's enthusiasm. Open a Cote du Rhone, sit back and listen to the master. I just wanted to let you know how much I enjoyed the Rhone Master Program. I didn't think you could top my Bordeaux Master experience but you did. Both programs gave me the depth of instruction and insight that was missing in my Sommelier Certification program. I have been recommending both to my Canadian sommelier colleagues. It was wonderful having the study manual resource in advance of the webinars and the quality of the visuals/handouts associated with the webinars was superb. I loved listening to Roger Bohmrich - his presentation style and diction made his lectures easy to follow and I am envious of his French pronunciation. As always the material was not only authoritative but presented in a very interesting way. Charles Curtis from Christies remains a real treat - the icing on the cake. Thank you to you and the Wine Scholar Guild for making this course a memorable experience. I look forward to joining you online again in the near future. I greatly enjoyed the Rhône Master Level Course. Even though I had previously completed Wine Educator Society, ISG, and Court of Master Sommeliers coursework, your course took me to a new level. It was a treat to learn from instructors with such intimate knowledge of the material. The study guide is an excellent learning tool and the online sessions helped to add even more depth. I would highly recommend the Rhône Master Level Course to all my fellow wine educators looking to gain a greater mastery of the region. This is the second on line masters-level course I completed. Rhone lives up to the high bar set in the first course on Bordeaux. The quality of Roger's instruction, guest lectures and materials was outstanding. Certainly recommend the course for anyone who wants to dig down and understand the whats and why's of what makes the Rhone such a great wine region. I thoroughly enjoyed the Rhône Master Level program. Roger Bohmrich is an inspiring, gifted teacher who made every class a delight. A special mention to Kelly MacAuliff, too, for his experience and humor, both much appreciated in his contribution to the course. Every aspect was first-rate, from the manual to the web interface to the classes themselves, and the course was quite comprehensive. Bravo to the Wine Scholar Guild for this excellent course - can't wait to take the next ones!